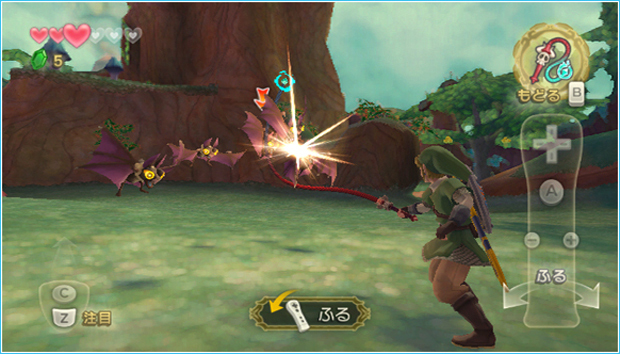 Here's a set of screenshots for Link's next adventure on the Wii, The Legend of Zelda: Skyward Sword. As you can see, the elfish lad is performing tasks he's pretty well known for carrying out. He's swinging a sword, shooting things at range, and all the other stuff you'd expect from a hero of his stature. I will say, swinging that whip interests me considerably. It would interest me more if it utilized the MotionPlus in the same way that the sword is going to, but that might be asking for a little bit too much. Doesn't change the fact that I'm going to inevitably wind up playing it.